Need a smart way to get to the next MN United match? Skip the traffic and parking stress and let Metro Transit get you to the action with ease. 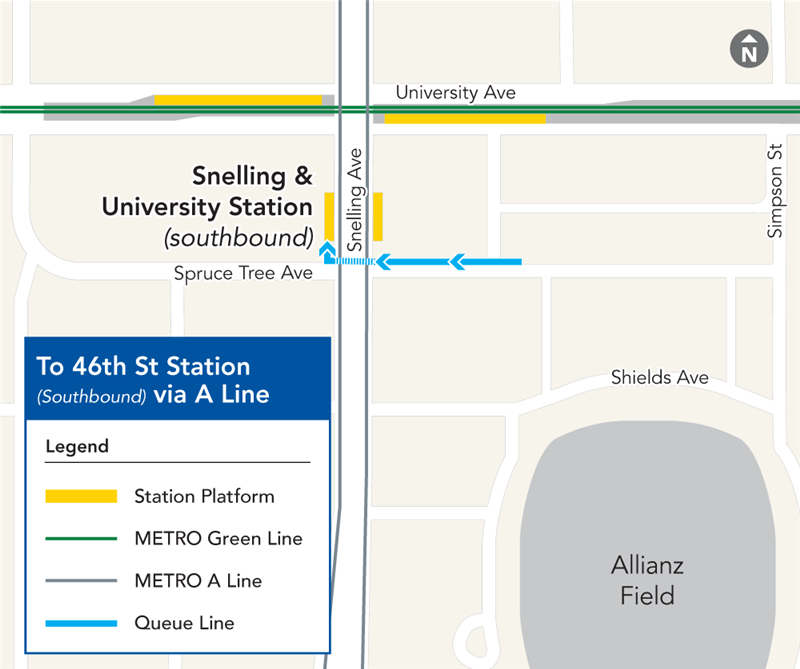 The METRO Green Line and the A Line take you right to the soccer pitch at the new home of the Minnesota United Football Club, Allianz Field. Once you ride with Metro Transit to a Minnesota United soccer match, you'll be hooked. 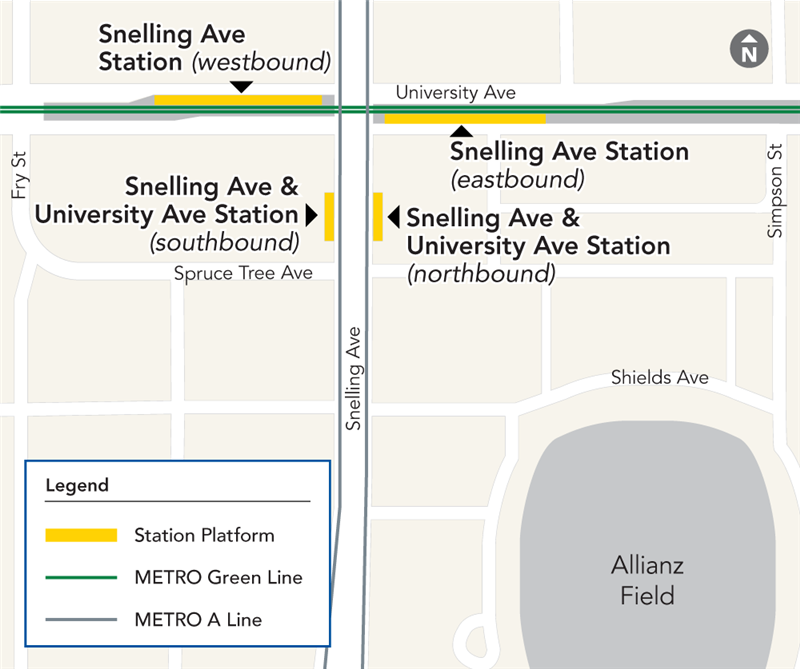 Taking the METRO Green Line? 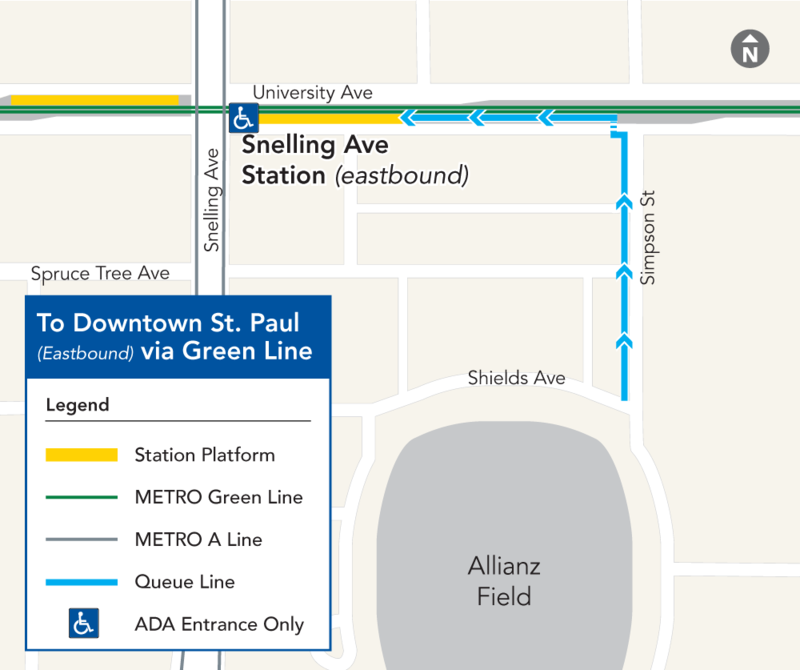 Get on the METRO Green Line from downtown St. Paul or downtown Minneapolis and head to Snelling Ave. Station for easy access to Allianz Field. 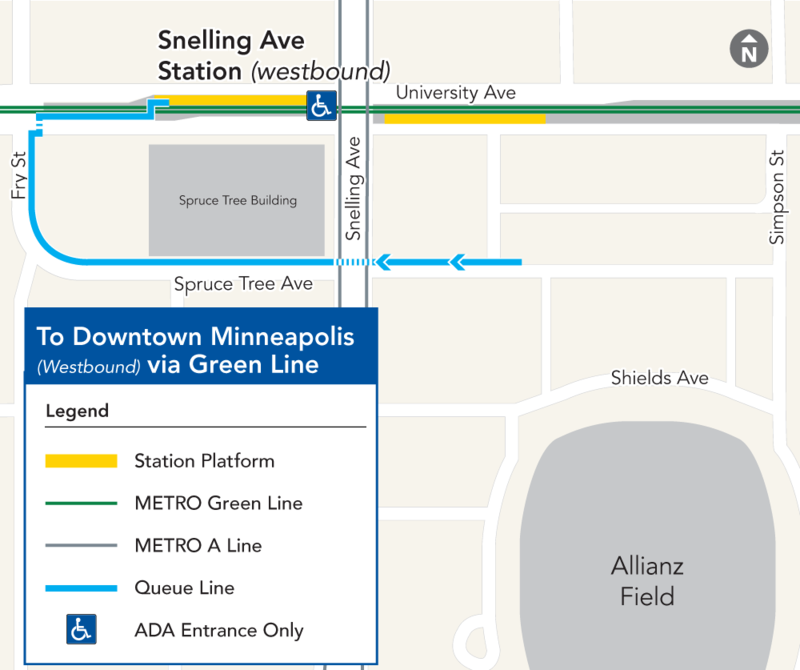 Or transfer to the eastbound Green Line from the Blue Line at U.S. Bank Stadium Station in Minneapolis. Get an All-Day Pass for an easy roundtrip. No standing in line for your return ticket! With an All-Day Pass, you're covered from time of purchase until 2 a.m. the next day for the same price as a roundtrip. Download our app for iOS or Android and buy your rail or bus ticket instantly! You will not be departing from the same location you arrive at; please consult the specific maps for Post-Game departure. 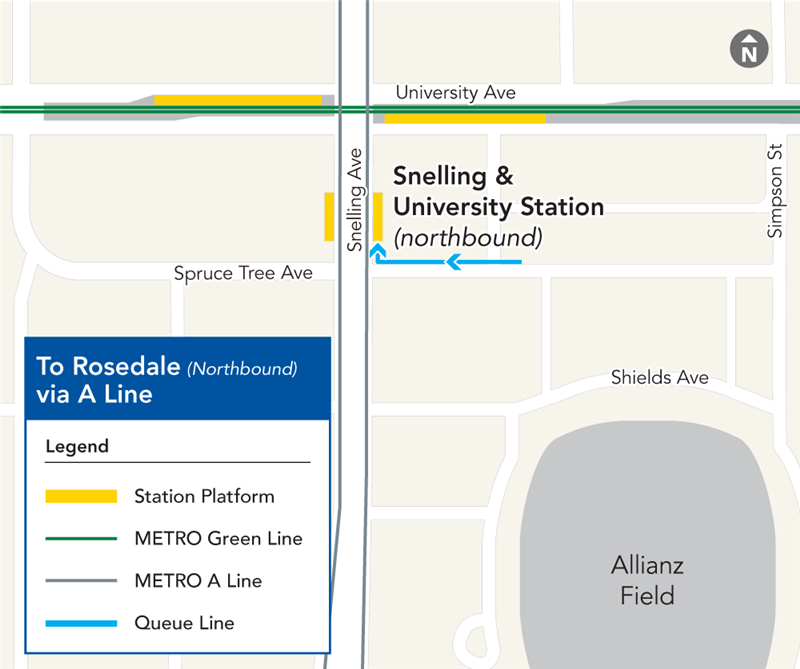 Besides the convenient METRO A Line, accessible from 46th St. Station in the south or Rosedale in the north, Routes 16, 21 and 84 also serve the area near Allianz Field. All buses and trains have free bicycle racks so you can take transit part of the way and pedal the rest. And with 400 bike parking spots at Allianz Field, its easy to make cycling part of your match-day experience! 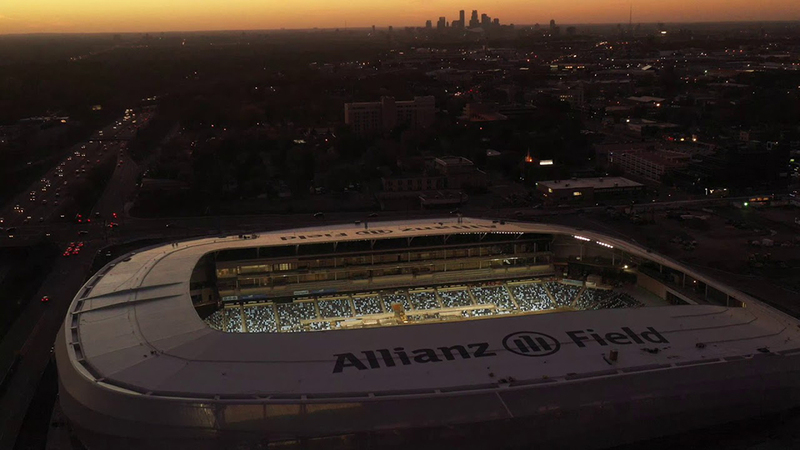 To help give fans additional options to arrive at matches, the City of St. Paul has also made four parking ramps in downtown St. Paul available within easy walking distance of the METRO Green Line which goes straight to Allianz Field. The City's Smith, 7A, Lowertown and Block 19 parking ramps will all be available to the public at a $5 rate on match days, beginning two hours before match start times.